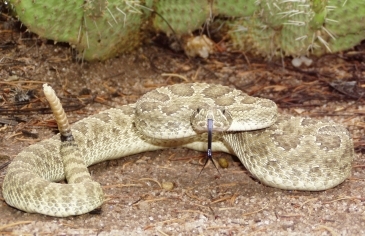 While the rattler similar to the one shown above can often be seen in the countryside near our Santa Fe offices, in this month's chapter of Willie Ryan's Tricks Traps & Shots of the Checkerboard, we're talking about a different kind of rattler; namely, a position that leaves you feeling, well, rattled. And, in Willie's example, who better to be the "rattlee" than that checker pedantic of yore, Harvey L. Hopkins, who, based on his writing, certainly seemed to be more than a little on the stodgy side. We can just imagine him becoming rattled indeed in the very odd position which arises below. Of course, Willie's remarks on "Chop Suey Checkers" and "Chinese checker games" might not pass muster in today's environment of political correctness, but we hope you'll allow the allusions; they're rather colorful and certainly well intended. "Old-timers say that Champion James P. Reed was un­beatable when he was sober. His uncanny ability to pene­trate the possibilities of play in complicated situations won him the distinction of being the greatest crossboard player of his day. Reed's main dish was 'Chop Suey Checkers,' a term he used to describe positions in which the pieces became en­tangled in complete confusion. The game below shows what happened to Harvey L. Hopkins, of Chicago, when Reed caught him in one of his Chinese checker games many years ago." A---This enigmatic move was a great favorite with Mr. Reed, and one which led opponents into a maze of complicated formations so dense that even seasoned masters often became hopelessly lost in their kaleidoscopic patterns. B---It should be noted that 31-27 also loses here, by 6-9, 27-18,14-23,15-10 (forced), 7-14, 24-15, 23-27, 32-23, 8-11,15-8,4-20, 22-18,1-5, etc., and black wins. Wm. F. Ryan. White's best move at B is 24-20, then 7-10*---C, 16-12---D, 14-18, 21-17, 2-7, 28-24, 19-28, 26-19, 18-23, 25-21 (31-27, 23-26, 30-23, 7-11, 20-16*, 11-20,*, 23-18*, 8-11, etc., a draw), 8-11, 15-8, 4-11, 15-8, 4-11, 19-16, 11-15, 16-11, 7-16, 20-11, 15-18, 22-15, 13-22, 31-27, 10-19, 27-18, 19-23, leading to a draw. Wm. F. Ryan. C---If 14-18 is used, white will win with 16-11*, 7-16, 20-11, 6-10 (forced; if 1-5, then 31-27, 19-24, 27-20), 15-6, 8-15, 21-17*, 1-10, 17-14, 10-17, 28-24, 19-28, 26-10, 17-26, 30-14, 13-17, 25-22, 18-25, 29-22, 4-8, 14-9. Wm. F. Ryan. D---If 22-18 is used, then the following moves will produce a draw: 1-5, 18-9, 5-14, 31-27, 14-18, 16-12, 2-7 (8-11 draws too), 15-11, 7-16, 20-11, 8-15, 25-22, 18-25, 27-11, 10-15, 32-27, 6-10, 11-7, 13-17, 21-14, 10-17, 30-14, 3-17, 27-23, 17-22. Wm. F. Ryan. Again at D, if 16-11 is used, black will win with 14-18, 21-17, 1-5*, 20-16, 8-12, 31-27, 3-8, 27-24, 5-9, 24-20, 9-14." Can you make your way through this one without getting rattled yourself? No need to hiss; just click on Read More to slither over to the solution. "Continue: 13-17, 18-9, 6-13, 21-14, 8-11,15-8, 4-27, 31-15, 23-27, 32-23, 7-10, and black wins." Additional comment at note B above: "'This is where Sir Hopkins went astray. An old journal, com­menting on this game, states, 'When Mr. Hopkins made this move, Reed deliberated for some minutes, and then by 13-17 began a stroke that clears 13 pieces from the board, winning decisively.' "
Do you note more than a passing resemblance between the winner of this encounter, James P. Reed, and our column's iconic hero, Marvin J. Mavin? "Unbeatable when sober," though more than a bit judgmental, seems to bear a valuable lesson about the incompatible nature of checkers and drinking. --Ed.